The First 18-Bit, 1MHz ADC in the industry with performance from -55C to +125C, ideal for all precision, ruggedized, high reliability, and demanding applications. 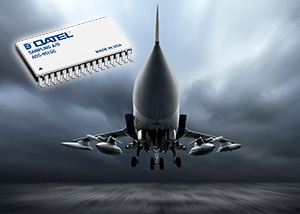 DATEL, Inc. has announced the introduction of the ADS-951 series, a new line of Analog-to-Digital converters that offer 18-bit resolution and are housed in a 32-pin hermetically sealed ceramic package. Each unit features no missing codes and is 100 percent tested for performance across one of three standard temperature ranges: 0 to +70C; -40 to +100C; -55 to +125C. The ADS-951 requires only the rising edge of the start convert signal to operate and dissipate less than 400 mW. The ADS-951 offers a unique architecture that includes a sample-hold, a successive approximation A/D, an internal reference, and timing/control logic. It features an excellent signal-to noise ratio (SNR) and a total harmonic distortion (THD), which makes the ADS-951 the ideal choice for both time domain (medical imaging, scanners, process control) and frequency-domain (radar, telecommunications, spectrum analysis) applications. The ADS-951 has been optimized to provide both the best static (DC) and dynamic (AC) parameters over the entire temperature range, in one package. Unlike other ADCs available, there is no need for any additional external components when using the ADS-951. All supporting features from front end signal conditioning/driver amplifiers, reference, digital drivers, and decoupling passive components are included in one package. Using the ADS-951 in a system provides a higher reliability/MTBF to the circuit and eliminates the need for additional components, real-estate, and cost; hence the user only needs to procure one component, the ADS-951. The ADS-951 series is manufactured in DATEL's USA facility, which is certified to MIL-PRF-38534 standards. The device is available in commercial as well as military versions. RoHS and non-RoHS configurations are available.